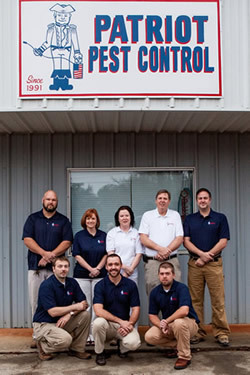 Patriot Pest Control has been serving the community since 1991. 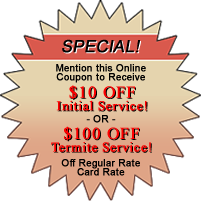 We offer several different services to take care of your termite or pest problems. Pest control service includes but is not limited to ants, roaches, mice, silverfish,spiders, earwings,fleas,rats and mice.we offer monthly, bi-monthly and quarterly pest control services with free recalls in between services if needed.all of our technicians are registered and fully trained to provide the most adequrte and safe treatment for your home. Since 1991 patriot pest control has treated over 20,000 homes for termites. We use the most advanced and safe chemicals on the market. (premise, termidor etc). We also offer our advanced baits systems for those who want limited chemical expousure. We offer free termite inspections and education on termites, powder post beetles, and wood decay fungi.we also offer pretreatments for new homes and additions. Patriot pest control offers a large variety of commerical pest control services, from apartments to large warehouses and more.we try to work with your schedule as much as possiable not to interfer with you and your operations. We offer full termite control and spot treatment for commerical buildings.we also offer our bait system treatment as a form of termite control for all commerical accounts. We also offer pretreatment for large commerical properties. For excess of moisture or mildew problems we offer poly barriers, and automatic foundation ventalators. We offer free inspections for these beetles and a free estimate to treat them.